Under $2.50 per serving. Seasoning chicken strips with McCormick® Taco Seasoning Mix is a great way to spice up dinner. 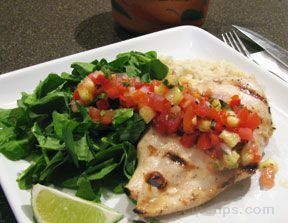 Sweet and spicy Salsa Chicken is delicious served with rice and black beans. 1. Place Seasoning Mix on plate or in plastic bag. Add chicken tenders; toss to coat. 3. Stir in tomatoes and preserves. Reduce heat to low; cover and simmer 10 minutes. Serve over rice, if desired.A Taste for Health Tip: Using McCormick® 30% Less Sodium Taco Seasoning Mix saves 211mg sodium per serving.